In recent years Walmart has emerged as a superpower in the suburbs. They have been taking over suburbia to the point where it people feel as if there is a Walmart in every neighborhood. 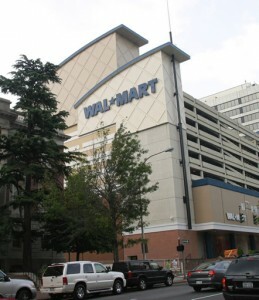 Now Walmart is working on their next business plan; to move their stores into the a more urban environment. 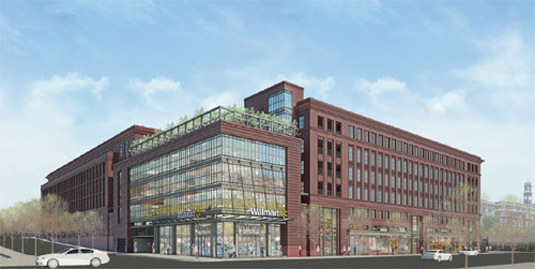 Walmart is talking about building stores in several major cities including New York, San Francisco, and Washington DC. The new stores will be significantly smaller than the super centers that exist in the suburbs. The stores will be closer to 20 thousand square feet as opposed to 150 thousand. This drastic change is size is just one of the hurdles that Walmart is facing when trying to relocate to our cities. So what’s the potential problem? Walmart has already proven that when it enters an area it takes away from the local businesses and sometimes destroys family owned stores. This has been common in suburbia, which is one reason why every suburb in America feels the same. If Walmart is successful at entering the city we may see this same thing happen in a more urban environment. Currently our cities are full of diversity and independently owned shops/businesses. This is one of the things that make our cities so unique. Walmart would probably drastically change the cultural diversity of the city and take away from the existing storefronts. In a worst case scenario, it would make places go out of business and leave storefronts empty, in effect destroying a city’s walkability. Also, local businesses are there for the long term. Businesses try to keep money in the neighborhood and build the surrounding area. Walmart, on the other hand, has been known to build a store and relocate several years later to a spot a mile down the road. I will be following this developing story closely in the future to see how it plays out. Hopefully the Walmart invasion will prove to not hurt our cities, but due to its effect on the suburbs its hard to not expect the worst.